Kids are fascinated by many things they see their parents do around the house. Things like cleaning, exercising, cooking, and painting just to name a few, but there are fewer things around the house that kids are fascinated by more than tools. Not just regular tools, not just big tools, any tools, and especially power tools. Many of us have taken the time to secure everything in our homes to make sure that the kids are as safe as they can be. But I bet if we look in the garage of most, if not all of us, we will find a battery in a charger that powers some sort of tool, and it will be in pretty close proximity to the tool it powers. Kids are curious and very fast learners. If your child has seen you clip that battery into the tool (like loading a clip into a handgun in their favorite video game or TV show), then there is a good chance they have already figured out how to do it themselves. Gone are the days when all tools required an extension cord, now virtually every home tool has a battery pack you can charge and reuse over again. Just look at the ads on TV for the battery operated weed eaters, lawn mowers, chain saws, drills, nail guns, the list goes on and on, and this only makes turning on these tools kids find in the garage or tool shed that much easier. 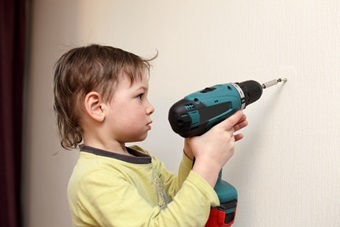 Non-power tools were estimated to have caused over 3000 injuries in children in the U.S last year, and power tools were estimated to have caused near 4000 injuries as well. What can we do? The answer like anything else is education and planning. If you have these tools in your home or on the property, please take the time and introduce the children to them and impress upon them how dangerous they are and how nobody ever touches them without an adult around. Much the same way you teach about weapons, scissors, and other dangers in the home, tools should be on that list as well. Eye protection. This is always a must and if you don’t do it, they won’t want to do it. Proper setting. Make sure you are working in a well-lit, well ventilated area. Proper dress. Make sure kids learn about covering up for protection from debris. Eyes, head, arms, legs. RESPECT for the machine. Kids must understand they are working with dangerous tools. Proper footing. Please don’t have your child stand on a wobbly chair and try using a tool. Good footing is a must. Proper ways to hold and use tools. These are just a few of the things to think about when teaching tool safety. Kids are quick studies and teaching basic safety before an accident may prevent one from occurring. Some major stores like Home Depot and Lowes have great kids workshops that are free and allow the kids to get hands on with tools and start on the road to using and learning about tools. As is true with any dangerous items, locking them up is always best, but not always possible, so do your best to keep them out of reach of the children. And as a side note, beware the charging batteries. There are numerous reports of battery chargers overheating and catching fire. Please read the recommended times to charge the batteries from the manufacturer. I hope this helps and I hope to see all your kids building great things in the future! Great Post! Thanks for sharing this useful tips. It is very informative. Thanks for stopping by Wilson. We’re glad you found the site helpful. I’m looking for some safety handling tips but all are busy with writing reviews about the products and I finally found Your’s. Very useful post and thanks for sharing this. Thanks very much for letting us know you found this helpful! 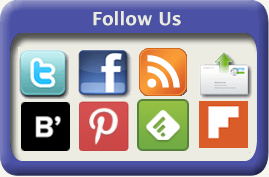 We love knowing when our posts make a difference! Have a great weekend!